I’ll be interested to find out what dinging table is used for. To answer your question I would make the mortise 3/8” wide and as long a possible into the leg. It is ok for the mortises to intersect and you can 45° the ends of the tenons where they meet. That gives you the strongest possible configuration. As to what a dinGing table is used for – important stuff. Thanks Mr Bondo – I appreciate your help. Good Day Sir. I ll be interested to find out what dinging table is used for. Sounds like my first table i made out of sugar pine. How are you chopping mortises? Drill? Router? When routing i am usually limited by router bit length. 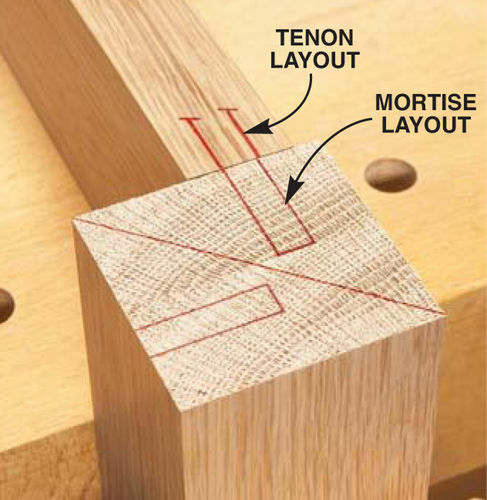 It is ok for the mortises to intersect and you can 45° the ends of the tenons where they meet. That gives you the strongest possible configuration. I’d be interested if anyone has tested this. In theory, at some point, a longer tenon doesn’t gain anymore strength while removing more material from leg(again in theory) would weaken leg. If the leg is hit hard enough, the leg will break, not the tenon. Regardless of length(within reason). I liken it to using a bigger screw in joining particle board. Doesn’t matter cause the screw isn’t the weakest link. Thanks Mr CW & SMP – I’ll be cutting the mortises with a mortising machine. As to Length of tenon I would tend to agree that at some point the length of the tenon doesn’t increase leg to apron strength. The tenons will also receive draw bored dowels. Thanks to all. I would do 1/2” mortises, since your using a mortise machine on 15/16” rails. 3/8” mortises will work. I also would set the mortises deep as bondo says. If your still questioning structure, then also install a couple pins into each, plugging the holes with buttons. 3/4” shoulder top and bottom. 2 1/2” is long enough with pins. Thanks Robert – feelun pretty good – about ready to glue up legs and apron along with corner braces. To confuse you ever more this is what Chris Schwarz has to say. Personally I’d do it like bondogaposis says or even a tad shorter to avoiding messing with the 45°. Either isn’t going to make or break you project. Many of tables have been made as pictured below and survived just fine. Alaskaguy – I prefer your example. With the glues as good as they are – that tenon will never have a glue failure and leaves the upper leg a stronger piece of wood. IMO.